Are you looking to make an upgrade to your home’s air condition system? A great addition to your home that will improve your cooling system is a programmable thermostat. Today’s modern thermostats allow you to have more control over the operation of an air conditioning system, which can help you reduce wasted energy and your heating bill. 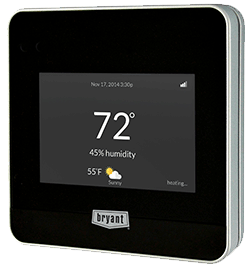 Still need a little more convincing of why programmable thermostats are so great? Here are three reasons why programmable thermostats can improve your home. Over time, a programmable thermostat will know your schedule and your house better than you do. A smart thermostat can learn your schedule and help save energy by keeping the system off when it is not necessary for it to be running and adjusting to any fluctuations in temperature. You can review the daily schedule of your thermostat and then make any changes that will help your thermostat improve your household. Remember the last time you went on vacation, and you forgot to reset your thermostat? Programmable thermostats take away all that worry and stress. 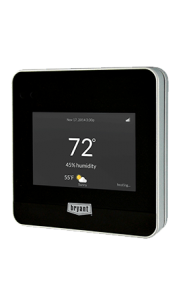 With most modern thermostats, you can control the settings right from your smartphone or anywhere you have internet access. This feature comes in handy whenever you are away from your home longer than you expect. The high-tech features may seem overwhelming, but trust us when we say that the latest models of programmable thermostats are filled with features that make thermostat a lot easier to use. With touch screen displays and everything you need to know and see is right there on the screen. Many models will show you alerts and maintenance reminders that will help keep your home running more efficiently. What we love about modern programmable thermostats is that they make adjustments based on your heating and cooling system on their own, which results in more money in your pocket. Have more questions about programmable thermostats? Give us a call, and someone from the Breedlove Dobbs will help you get a programmable thermostat in your home.